Men and primates have had fractious relationships over the millennia, but tensions really came to a head in the late 1970s and early ’80s after some significant pop culture events. 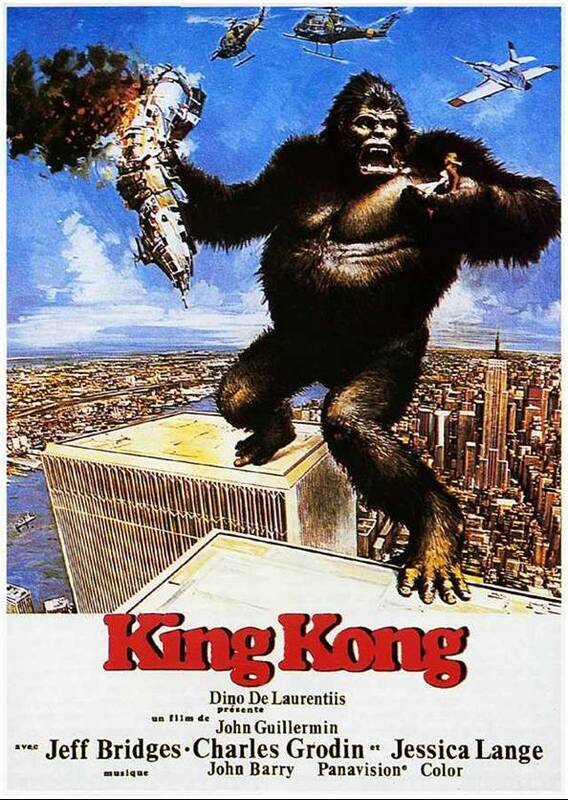 First, there was the 1976 “King Kong” remake that grossed close to a hundred million dollars, but did neither species any favors. Several years passed before the feces-throwing and safari hunting subsided, then Nintendo released the unbelievably successful Donkey Kong for arcades in 1981. Primate/man relations sank to an all-time low, as man sank voracious amounts of time and quarters into destroying the supposedly “misunderstood” (according to the apes) Donkey Kong. The primates struck back quickly (forcing Nintendo to do their bidding at fist point) with Donkey Kong Jr. in 1982, casting Jumpman, the hero of the first game, as the villain who captures Donkey Kong. Men tried striking back in 1983 with Donkey Kong 3 and Congo Bongo, both tales about villainous primates interfering with the work of Stanley the Bugman and an unnamed red-nosed safari hunter, respectively. But by 1983, the arcade industry was sinking and nobody cared about the misadventures of a two-bit bug-sprayer and a drunken poacher. The primates saw the games’ lack of success as retribution enough. By 1984, primates and men put their disagreements to the side and joined forces against Big Brother. Both species were subsequently wiped out in the Great Reckoning and replaced by history-revising robot dictationists. But before we explore the fulfillment of Orwellian prophecy, let’s zoom in further on Congo Bongo or, as it’s come to be called (by me), “Gorilla Stew.” Congo Bongo‘s ingredients consist of one-part Donkey Kong (man-vs-ape), one-part Q-Bert (dig that tripped-out isometric perspective), and two-parts Frogger (using creatures as pathways to greatness). All told, Congo Bongo is a four-level arcade game with a dearth of original ideas. Lack of originality isn’t a sin, though, and the combination of elements from three enjoyable games could result in a singularly excellent game. 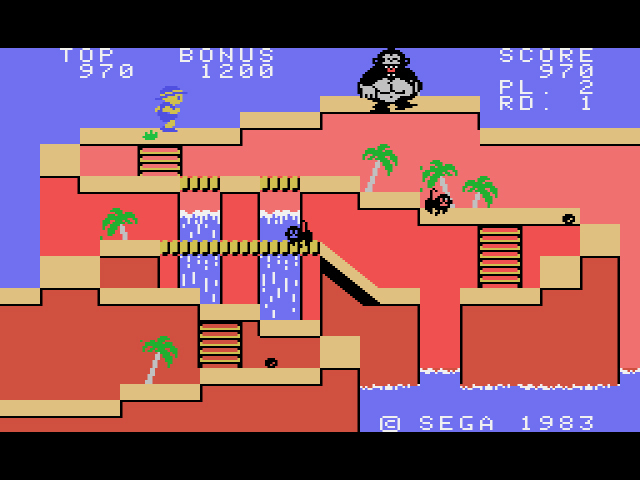 Aside from an inspired first level, which re-imagines the first-level of Donkey Kong from an isometric perspective, Congo Bongo feels tired, as though Sega couldn’t extend inspiration from the first level into the rest of the game. 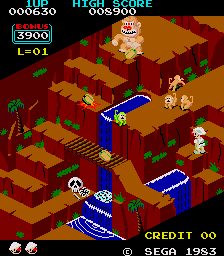 This is the first level of the arcade version. Graphically impressive, to say the least. Level 1 begins with your drunken poacher shambling up a cliff (the poacher’s climbing animation is particularly fantastic) while avoiding monkeys and coconuts thrown by Bongo the ape. If you touch the monkeys, they cling to your back, but you can shake them off by jumping because, for whatever reason, you don’t have a weapon. Surely excessive amounts of alcohol increases one’s love of firearms? At any rate, once you’ve climbed to the top and confronted Bongo, he shuffles off screen and, er, you’ve abruptly won that round. Level 2 is a jump across water, snakes, and a generous hippo to Bongo. Level 2 also ends abruptly, not because of Bongo’s eerie “I’m slowly hobbling away!” animation, but because it’s short and uneventful. Even a beginner player could finish the level in three carefully timed hops. Level 3 is equally banal: avoid the charging rhinos, either by jumping over them or hiding in the carefully provided “hidey-holes.” Reach Bongo, watch him hobble away to safety, and it’s on to Level 4 where you cross a river using lily pads, hippos, and fish. After the poacher burns Bongo’s buns to a crisp, the levels repeat. Level 1 re-emerges, this time in a more difficult state, but more importantly, as a tease of the pure isometric Donkey Kong-ripoff that might have been. This is the first level of the SG-1000 version. Well then. The SG-1000 version is one of several Congo Bongo home ports, but to my knowledge, it’s the only version Sega developed for their own hardware. The arcade Congo was developed on Sega’s Zaxxon hardware, which ran on a slightly more powerful Z80 processor than the Z80 which powered the SG-1000. It’s understandable then that Sega would have had to make graphical concessions for the home port. Level 1 in the SG-1000 version is viewed from a side angle, whereas Level 2 is viewed from a top-down perspective rather than the arcade game’s isometric view. Both levels work well-enough (particularly Level 2, which is an improvement on the arcade version), but after Level 2, the game starts over and the levels repeat. Two stinking levels? Do you take this Congo Bongo port to be your lawfully woeful waste of money? Two levels on a maddening loop, until death or sanity or the power switch do you part? Excising two of the game’s four levels was an odd decision on Sega’s part, especially when Borderline – a 1980 Sega arcade game that was also ported to the SG-1000 – was able to retain its four levels. 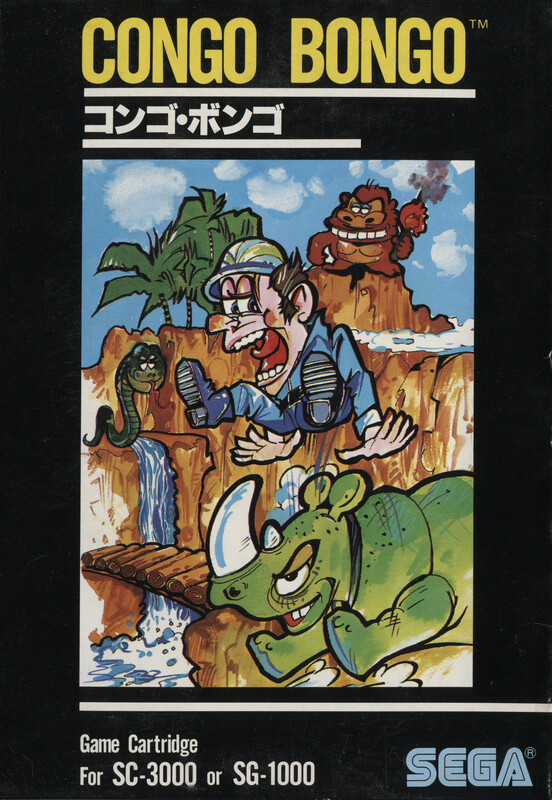 At the very least, Sega could have downgraded the two missing Congo Bongo levels in the SG-1000 version, regardless of original arcade hardware differences. At a time when the SG-1000 could have used a big arcade-faithful port to drive system sales, Congo Bongo for the SG-1000 feels too slight to be of any significance. *All of the above is true and should be believed with every ounce of your being. 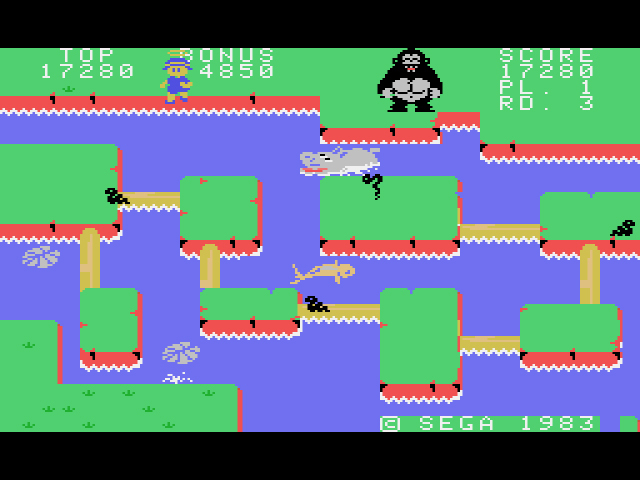 Thanks to Arcade Museum for the arcade Congo Bongo screenshot! I’ve always wanted to like this game based on the arcade , but I never could get past the control. This version doesn’t seem much better. And how can the Coleco port look much better on similar hardware than the Port Sega made themselves. Colecovision one still plays crappy. Well it was done by a company that wanted to ‘bring the arcade experience home’ and it paid off a bit for them. Zaxxon on the CV also looked pretty good too. Played both a lot when I was 6. Said company must have cared more than Sega did for their own console. Shame, really.